Links and PDF files in your offer. Why is it a bad idea? You are editing one of the offer descriptions in the Booking Engine. Let us say, it is the Easter offer which focuses on the specialties of the ceremonious breakfast. Why duplicate content if we could attach the existing PDF file to the offer? Do we really want to do this? It is certainly easier, but not necessarily better. Let us consider a different scenario. The offer for the extended weekend including a range of payable attractions. You have created the price list beforehand and put it on the website. Again, your offer in the Booking Engine is linked to the website to avoid creating duplicates. Why is this a bad idea and what to do in such a situation? Now, let us change the perspective. How does it look from the guest's perspective? You start searching for an idea for a stay, you are considering offers of several different hotels. Finally, you arrive at the X hotel's website, you go to the Booking Engine and you find a promising offer. You read the description, but the important part has been included in the PDF file. You feel everything but delighted. You are already viewing the offer and you don't understand why you need to look elsewhere. You click the download button, anyway. You wait a few seconds, depending on your broadband speed. If you are in a hurry (and who is not in a hurry nowadays), your initial surprise turns into a slight irritation. Some people are likely to give up in such a situation: it was easier on the competitive website. Let us suppose, however, that you have survived the ordeal. 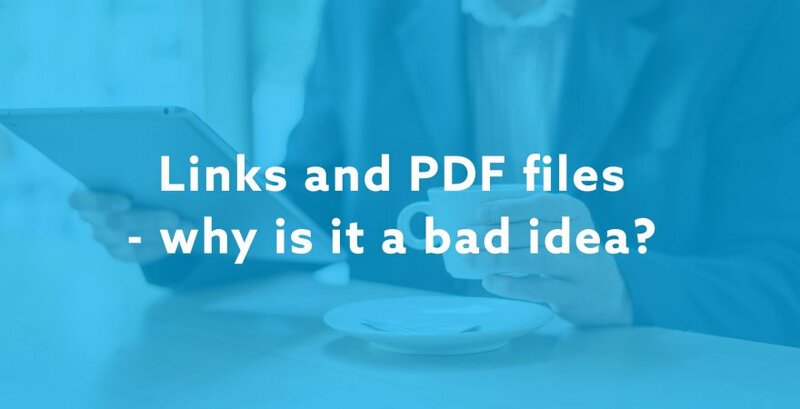 The file has already been downloaded, but do you have an application which reads PDFs? Not everyone has one, but again, let us assume you do. Either way, your among the group of persistent individuals who have reached this stage. Others abandoned the search by now or returned to the offers of the competition. It seems a lot easier if you use a desktop. The PDF opens, you browse it relatively well, even though the scroll is a little sluggish and the text search does not work. If the text is properly formatted and the document is created in a vertical orientation, at least you do not need to tilt your head 90 degrees to read the text. Let us assume you have read the offer and want to go back to the Booking Engine to check prices and dates again. You may even make a booking. What now? Where am I? Where is the "book" button that you have just seen? The "Back" button does not work because the PDF has been opened in a new tab. Where is the correct tab? Let us assume, however, that you are using a mobile device (and about 50% of users visiting our Booking Engine do so). The PDF is loaded, but the application scales the view to fit the size the screen. You see completely illegible rows of small print. You zoom in the text. Now, in turn, the text does not fit the screen and you have to move the document back and forth. You have no clue what it says. Besides, where have the prices and the 'Book' button gone? It is not a coincidence that the web is created in HTML, not a set of PDF, DOC or XLS files. HTML is fast and light. It adapts to the width of the screen. PDFs have been created to serve a completely different purpose. In this case, the scenario is quite the same. You invite the guest to the offer page, you host him, but for one of his subsequent questions, you answer "I cannot help you with your request, could please ask my colleague?" The guest has made up his mind, he was about to make a booking but you referred him elsewhere. Is he coming back to complete his booking? Some guest will do so, some will not. The answer is the "Additional information" feature. The feature comes handy when you want to include additional, detailed information which is difficult to include in the main description when you do not want to make it too extensive. It comprises, for instance, menu, detailed hourly schedule of stay, special booking conditions, price list for additional attractions, and much more. Visitors will view the additional information in a friendly and accessible form, directly on the offer page. At the same time, they will not find the text overwhelmingly long.